As you enjoy your long-weekend on this first Monday of September, take a moment to read this article in full and learn the history of Labour Day, which sadly these days, is more often viewed as the last summer long-weekend as opposed to what those who fought so long for it really intended it to be. Labour Day is a heartfelt celebration of labour, workers and their families, and to affirm the dignity and honour of working people everywhere. Today we take paid holidays, safe work places, medical care, unemployment insurance, fair work hours, union wages and “the weekend” for granted. Perhaps this comes only from the labour movement's enduring success in improving the lives of so many working Canadians. How many of these advances would have happened if it were not for the long-forgotten heroes who fought so hard to make unions, and Labour Day, a reality in the first place? Workers created unions to protect themselves in what were then viewed as new impersonal labour markets - like some unfortunately remain today. Although the first unions were small local organizations, they attracted hostile reactions from governments and most employers. In fact, governments declared unions illegal. Union sympathizers confronted constant harassment, firings, blacklisting, and arrests. Despite this opposition, poor wages and dangerous working conditions led to an increasing number of strikes and protests. At the turn of the century, workers often toiled for 60 to 70 hours a week. The work in the factories and on the assembly lines was repetitious, and often physically demanding. Many labourers were seriously, sometimes fatally, injured due to faulty equipment, poor safety measures or human error. As unions began to organize, the working conditions of workers slowly improved. The first signs of permanent unions date to the mid-nineteenth century. In manufacturing towns, craft workers such as printers, shoemakers, moulders, tailors, coopers, and bakers established local unions. Railroad workers also actively pursued trade unionism. In the hostile atmosphere of this era, the life of these associations proved fragile and their existence was never guaranteed. Eventually, unions strengthened their situation through the creation of local assemblies, and by looking farther afield to establish links with the larger British and American unions. One of Canada's first sole Canadian unions was the Canadian Brotherhood of Railway Employees (CBRE). Founded in Moncton, New Brunswick by Aaron R. Mosher on October 12, 1908, the union diversified its membership from railway workers of blue and white collar clerical workers to include highway transportation workers, hotel and hospitality, health workers and seafarers to name a few. 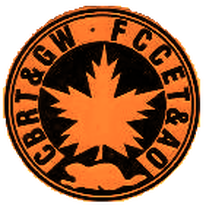 Based on the diverse membership of the CBRE, which was continuing to grow, the union changed its name to one that was more fitting given its wide diversity, thus the Canadian Brotherhood of Railway, Transport and General Workers Union (CBRT&GW) was born. Unifor National Council 4000's roots are proudly associated with the CBRT&GW. We were CBRT&GW members up until the merger with the Canadian Auto Workers Union in June 1994. The merger between the CAW and CBRT&GW (which then was shrunk to 33,437 members due in a large part to the mass downsizing of Canadian National Railways) was the largest merger during the 28-year existence of the CAW. In addition to starting the CBRT&GW and becoming its first National President, Mosher was also a founder of the All-Canadian Congress of Labour in 1927 and the Canadian Congress of Labour (CCL) in 1940. The CCL would later merge with the Trades and Labour Congress of Canada (TLC) to form the Canadian Labour Congress (CLC) in 1956. As a seasoned veteran of union battles over nationalism, communism, and industrial unionism, Mosher was named honorary president of the CLC upon its formation. Of the many accolades Mosher's career in the labour movement brought him, the biggest came in 1981 when the Government of Canada issued a stamp in honour of him. Not only was the stamp issued in the centennial year of Mosher's birth, but also on the 25th anniversary of the Canadian Labour Congress and was officially released on Labour Day. 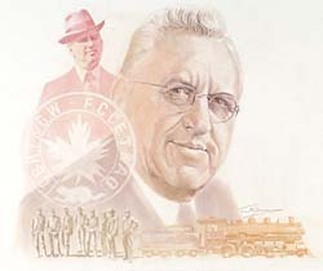 To date, Mosher is the only union leader ever to be depicted on a Canadian postage stamp. The stamp includes the figures of two railway workers flanking Mosher's portrait. It is as near as we come to a stamp paying tribute to organized labour in Canada. Over the years, there have been many influential labour leaders who worked relentlessly to improve the lives of working Canadians that helped create the middle class. We focused on Aaron Mosher based on our ties to the first truly Canadian union that he formed, and in during his years, being Canada's foremost advocates of national unionism. In March of 1919, Western Canadian labour leaders and delegates met in Calgary to discuss the creation of One Big Union. 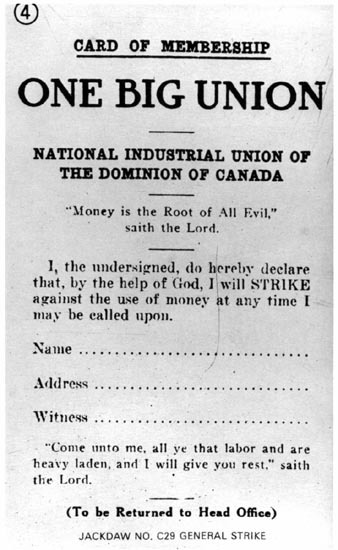 They decided to conduct a referendum among Canadian union members on whether to secede from the American Federation of Labor (AFL) and the Trades and Labour Congress of Canada (TLC) and form a revolutionary industrial union to be called the One Big Union (OBU). Thousands of men and women - some unionized and some not - from different trades of skill and different ethnic backgrounds shared class solidarity of inequality in Canada and wanted to achieve what was essential for themselves. 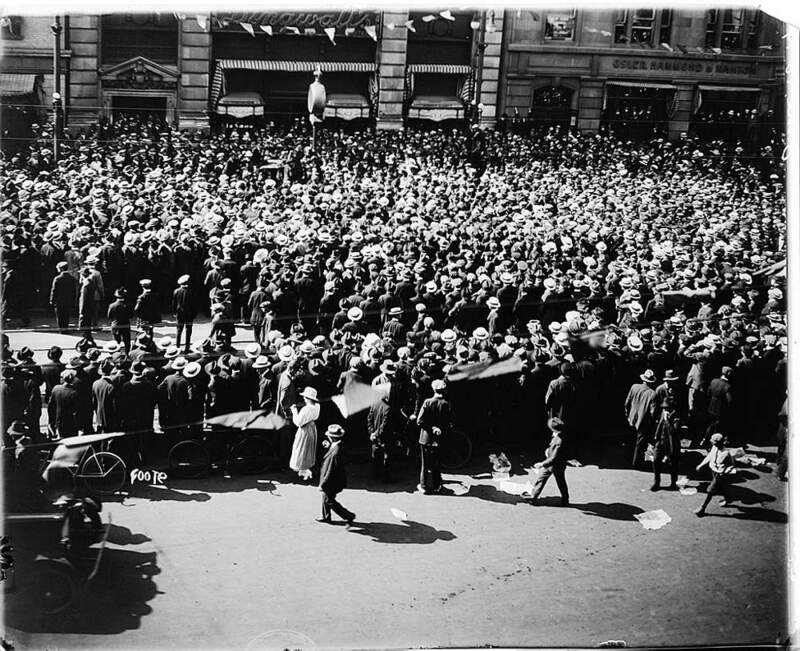 The vote, held almost entirely in the West, was conducted at the same time of the Winnipeg General Strike. The vote was overwhelmingly in favour of forming the OBU, also referred as "The Great Fist", and was initiated formally in Calgary on June 4, 1919. The OBU merged into the CLC in 1956. The Winnipeg General Strike of 1919 was one of the most influential strikes in Canadian history, becoming a platform for future labour reforms. Although many Canadian companies had enjoyed enormous profits on World War I contracts, wages and working conditions were dismal and labour regulations were mostly non-existent. 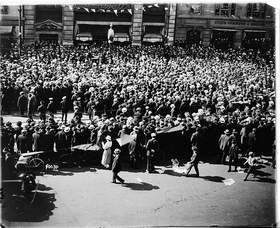 Massive unemployment and inflation, the success of the Russian Revolution in 1917 and a wave of strikes across Canada and rising revolutionary industrial unionism all contributed to postwar labour unrest. When negotiations broke down between management and labour in the building and metal trades on May 15, 1919, the Winnipeg Trades and Labour Council (WTLC) called a general strike in what led to one of the best known stands taken by labour unions and activists. The Winnipeg General Strike is just one of the many struggles that trade unions and labour activists - men and women - have fought over many years, struggles that today have brought workers all across Canada rights to secured union recognition, collective bargaining, improved working conditions, wages and benefits, to name only a few. Today, sadly, right-wing politicians - Conservatives in Canada and Republicans in the United States - work collaboratively with wealthy corporations and the richest 1% of society. They have created special interest groups, right-wing think tanks and acquired news media to spread their agenda of advancing an anti-union, anti-Rand Formula, anti-public services, anti-taxation and pro free-market agenda nationally and provincially that benefits only the wealthy. Groups like the Canadian Taxpayers Federation, the Fraser Institute, the National Citizens Coalition, the MacDonald-Laurier Institute, the Canadian Federation of Independent Business or the Frontier Centre for Public Policy, these are just a few of the groups that are pushing the Conservative agenda in Canada, an agenda that will take us back in time to an era similar to what is explained in the foregoing paragraphs of this article. Are you willing to allow that to happen? We must never take for granted our past achievements in what provides us with the many benefits and social standards we have today. In Solidarity - Happy Labour Day!